Scotland has produced a fair share of weighty theologians, and Paisley-born Hugh Ross Mackintosh (1870-1936) is among her best. From 1904 to 1936 he served as Professor of Systematic Theology at New College (TF Torrance took his systemetics class during 1935-36), where he himself was formerly a student. Between his student days and his teaching days, Mackintosh served churches in Largs (1896-1897), Tayport (1897-1901) and Aberdeen (1901-1904), and also spent time in Freiburg, Halle and Marburg, where he befriended the great Wilhelm Herrmann. 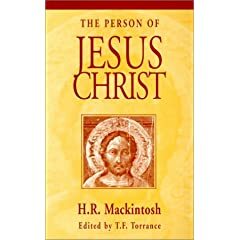 Mackintosh’ most significant work was The Person of Jesus Christ (republished in 2000 by T&T Clark) in which he closely followed PT Forsyth’s kenoticism (still, to my mind, the most compelling presentation of the doctrine; though I am awaiting the full exposition of McCormack’s kenoticism). He also penned Christian Experience of Forgiveness, a brilliant work which creatively restates the doctrines of justification and atonement, urging that justification is forgiveness and that the cross is forgiveness’ cost to God. ‘Locating a Christology book that is both solidly doctrinal and warmly devotional is rare, but The Person of Jesus Christ by Hugh Ross Mackintosh rewards on both counts. It is at once an exposition of the figure of Christ as God and man, and a celebration of Christ himself. Originally delivered as a series of lectures at Christian student meetings in 1912, Mackintosh’s lectures give the impression of being more of a personal meditation on the person and work of Jesus Christ than a scholarly paper devoid of any emotion. This is an advantage, as it is doubtful a lesser work would have lasted in print these almost one hundred years since its first publication. An eminent scholar in his own right, in our time Mackintosh has been obscured by his considerably more famous pupil, Thomas F. Torrance. Fittingly, Torrance has written an introduction as a postscript appreciation for T&T Clark’s reissue of this worthy little work. In the introduction, Torrance iterates the value of Mackintosh’s book, explains how it came to be published, and briefly outlines the control center of Mackintosh’s theology, the atonement. Mackintosh himself called the atonement “the subduing magnitude of the Divine sacrifice.” It should be noted that ‘subduing’ is a word frequently deployed in this short book; one gets the distinct sense that Mackintosh was often rightly overcome by the enormity of his subject matter. The main body of the work sets out “to contemplate the Lord Jesus Christ reverently in … his attitude to men in Palestine … as he still speaks and lives within human souls … [and] to indicate his connexion with the inner life of God.” No problems are more sublime, Mackintosh says, and no problems are so intensely practical. Here is a professor who sought not to live in the ivory tower, but to commune with Christ and his fellowmen in the highways and byways of life. Every section is simply beautifully crafted. Only one page into the work, I was struck by the way Mackintosh sets up the confluence of the Father and the Son: Jesus “cannot think of himself without thinking also of God who sent him and who is perpetually with him … I am he, he said; I am the Sent of God, in whom every promise is answered and every human prayer fulfilled.” Mackintosh goes on to investigate Christ’s claims to Messiahship, his forgiveness of sins, his miracle-working, and the meaning of his sufferings. Finally, Mackintosh explores Christ’s role “in the relationship of God to man which no other can ever fill.” In this section, Mackintosh propounds an understanding of God’s majesty and holiness that is not in the least at odds with Divine Love, and ends with a gospel call of Christ’s lordship over all of life. His admiring student T.F. Torrance rounds out the book with an appreciation essay originally published in the Scottish Bulletin of Evangelical Theology thirty years after Mackintosh’s death. In it, Torrance continues to grind away at the reality of Christ in Mackintosh’s life and thought, and traces the intellectual genealogy of Mackintosh’s theology. Most winsomely, Torrance paints a vivid picture of a sixty-five year-old Mackintosh entering the classroom, brow still furrowed from pondering the intricacies of the person and work of Jesus Christ. Besides the extraordinary writing craft Mackintosh obviously possessed, two other things stood out in this book. Firstly, that Mackintosh was a friend of Wilhelm Hermann, the liberal theologian who had an early influence on J. Gresham Machen. Like Machen, Mackintosh was able to distill genuine Christological insights out of Hermann’s liberalism. And although he would often publicly disagree with Hermann’s theological positions, ad hominem attacks had no place in Mackintosh’s vocabulary. Secondly, I was struck by a seemingly different historical picture than I learned in high school and university. I had always understood the years leading up to World War I in terms of fin de siècle ennui (industrial-age world-weariness) but here is a professor of the period describing what he identifies as a then-contemporary fascination with the figure of Jesus Christ, both as a historical figure and a Savior.